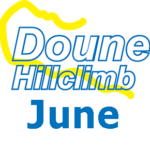 The June & September Doune National B event is open to competitors who only hold a National B licence and are members of any Motor Club that is part of the Scottish Association of Car Clubs, Scottish Sprint, Hillclimb and Speed Championship, Lothian car Club or invited clubs. Membership or Registration Cards must be shown. attempted to do so. Sunday practice maybe curtailed to suit prevailing conditions. First timed runs will commence on Sunday at a time to be announced by the Clerk of the course on the day.